You'll be £19.99 closer to your next £10.00 credit when you purchase Early Ships and Seafaring: Water Transport Beyond Europe. What's this? In this volume Professor Seán McGrail introduces the reader to a relatively new branch of Archaeology – the study of water transport – how early rafts, boats and ships were built and used. Concepts, such as boatbuilding traditions, ship stability and navigation without instruments, are first described. Archaeological research is then discussed, including sea levels in earlier times, how to distinguish the vestigial remains of a cargo vessel from those of a fighting craft; and the difference between a boat and a ship. Chapters 2 and 3, the heart of the text, deal with the early water transport of the Mediterranean and Atlantic Europe, from the Stone Age to Medieval times. Each chapter includes a description of the region's maritime geography and an exposition of its boat-building traditions. The third element is a discussion of the propulsion, the steering and the navigation of these early vessels. The sparse, often jumbled, remains of excavated vessels have to be interpreted, a process that is assisted by consideration of early descriptions and illustrations. Studies of the way traditional builders of wooden boats ply their trade today are also a great help. Experimental boat archaeology is still at an early stage but, when undertaken rigorously, it can reveal aspects of the vessel's capabilities. Such information is used in this volume to further our understanding of data from boat and ship excavations, and to present as coherent, comprehensive and accurate a picture as is now possible, of early European boatbuilding and use. Overall, I found this book interesting, but a little too dry sometimes. If you have a keen interest in the sea, sailing and ships, I think this would be excellent. There is an assumption that the reader will have a basic working knowledge of boats, such as what a punt or a boom is. I obviously did not, but that is nothing that a little googling can’t overcome. This book follows an earlier book by Prof McGrail which covered vessels and water transport in Europe. This one covers Egypt, Arabia, India, Australia, Southeast Asia, China, Oceania and the Americas. Each chapter commences with maps and a description of the region’s water transport needs and geographic characteristics. Then follows an encyclopaedic description of just about everything that is known about the vessels, the navigation, the routes, the construction materials and methods. Since boat-building materials are perishable, very few remains of ancient boats and vessels exist, with the notable exception of funerary boats buried in the dry conditions of Egypt. The boat building practices of cultures at the time of first contact with Europeans are detailed, with the assumption that the techniques might represent ancient methods which probably have changed little from ancient times. eg. Tasmanian aborigines. The information in this book is fascinating but it is not an easy read. The non-expert reader will need to refer often to the lengthy glossary, to the abundant maps and the excellent diagrams. sail through a vast world of early ships and boats with an expert pilot. The author has followed his popular and important “European Water Transport” with a book to complete the picture by reviewing water transport beyond Europe. The level of detail and research is first rate with many illustrations. The work is most interesting in charting ancient craft that navigated the open seas successfully and those that provided secure transport on inland waters – Highly Recommended. An excellent companion volume to the 2014 Early Ships and Seafaring: European Water Transport. This volume provides an easily accessible and widely informative insight to readers with an interest in the types, construction, use and navigation of early vessels using the best available evidence from archaeological, ethnographic, documentary and iconographic sources which are as accurate and comprehensive as possible, while providing the student with serious points for discussion and further research. This volume should prove valuable to both the general reader and the student of archaeology in general. Early Ships and Seafaring: Water Transport Beyond Europe is a welcome addition to the research field of ancient seafaring and its relevance to methods still in use today. Contemporary mariners - master and novice alike - should read McGrail's book to appreciate the impact of trade routes on innovation and to inspire further experimental archaeology and ethnographic research. Although my primary interest is in the Age of Fighting Sail I’m always drawn to books dealing with the engrossing story of man’s exploration and exploitation of waterways and then the sea. 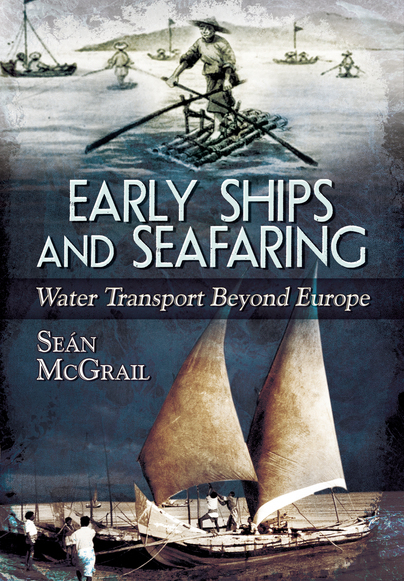 In this book, Seán McGrail’s study of European Water Transport moves out to cover Egypt, Arabia, India, Southeast Asia, China, Australia, Oceania and the Americas. Each chapter presents a convincing picture of ancient boat building and seafaring in that region. The early rafts and boats of those regions were, as in Europe, hand-built from natural materials and were propelled and steered by human muscle or wind power and this volume ranges in time from the prehistoric to today when a number of such traditional craft continue to be built. As a qualified shipwright myself I particularly relate to the extensive and well chosen selection of diagrams and photographs of construction of such craft included in this book. McGrail served in the Royal Navy before embarking on a career in maritime archaeology. He was Chief Archaeologist at the National Maritime Museum, Greenwich and is currently Visiting Professor of Maritime Archaeology at the University of Southampton. The study of water transport – how early rafts, boats and ships were built and used – is a fairly new and fascinating area of study in archaeology. In Egypt, not only have accounts, models and illustrations of ancient rafts and boats survived but also a number of the early vessels themselves have been excavated, some dates as early as the 3rd Millennium BC. In regions such as the Americas, on the other hand, few ancient craft have been excavated but we are able to draw on accounts and illustrations compiled from the 16th century onwards by European seamen and explorers. In most regions of the world a variety of water transport has been built, limited only by the raw materials available. On the island of Tasmania, however, an early rise in sea levels cut contacts with Australia, leaving Tasmanians with simple types of Stone Age water transport that fascinatingly survived in use until Europeans ‘discovered’ them. McGrail admits that worldwide, much remains to be learnt about early water transport by excavation and by ethnographic studies of those traditional rafts and boats that have survived. I look forward to more discoveries in this compelling field.